It's hard to believe, but it's been 40 years since a bunch of brash young guys from the Southern California Contest Club set out to show the world how to do Field Day. 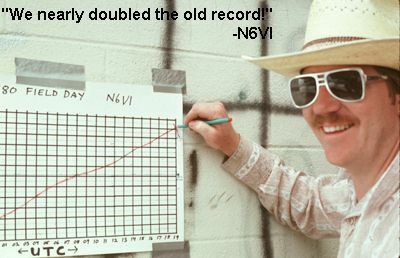 We had a strategy--and we had the hardware to pull it off, thanks to a binge of tower-trailer building. The strategy was to set up on a first-rate mountaintop with large monoband Yagis on tower trailers and run QRP to qualify for all possible multipliers. The theory was that killer antennas and a prime location would give us a decent signal (if not a big signal) compared to other Field Day stations, even with very low power. Ironically, finishing second overall in 1979 was what made 1980 such a success. We finished second to the Wireless Institute of the Northeast (WIN) station, W2RQ/2. There were 31 operators at W2RQ and they competed in Class 5A. They had 16,276 points--barely more than we had with seven operators in the two-transmitter class. We decided to recruit more good operators, build more antennas and tower trailers, and operate several more transmitters. We also sent out a challenge to W2RQ: we told them that they would NOT beat us again. When it was over, most of the SCCC Field Day participants nearly collapsed in exhaustion--and vowed never to do a Field Day on that scale again. And the truth is, most of us kept that vow for nearly 20 years. We got on with our lives and went on to other challenges in amateur radio. 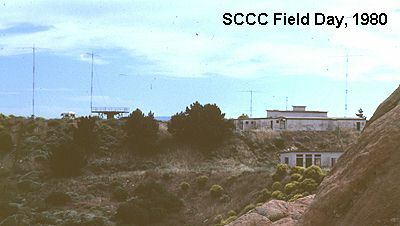 Some of us did go on several Field-Day style DXpeditions to Baja California for the CQ Worldwide DX Contest in the early 1980s. 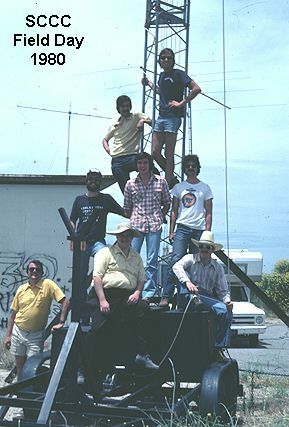 The photo at left shows two-thirds of the operators in the 1980 Field Day: (from left by rows) N6MU, AD6C, N6VI, N6MI, AA6RF, AE6E, KA6CPL and N6FE. In the background is some of the graffiti that even then covered the abandoned buildings atop Saddle Peak (which is between Santa Monica and the west San Fernando Valley). Our all-time scoring record? It was broken 14 years later by the Conejo Valley Amateur Radio Club, operating in the 15-transmitter class. Even with 15 transmitters, CVARC didn't quite equal our QSO total, but they had more points. Their line score was: CVARC (15A battery) - K6CAB - 3460 - A - 24 - 30,150. Another irony is that I was the speaker at the Conejo Valley club meeting in November, 1994, the month those results appeared in QST. None of the Conejo Valley folks seemed to know that they had broken the all-time Field Day scoring record, much less who held the old record. Here are a few photos from SCCC's Field Day glory days. This photo shows the SCCC crew leaving N6NB's house in Woodland Hills for Saddle Peak.